There is nothing more spectacular than steam locos working hard through a snow-covered landscape. 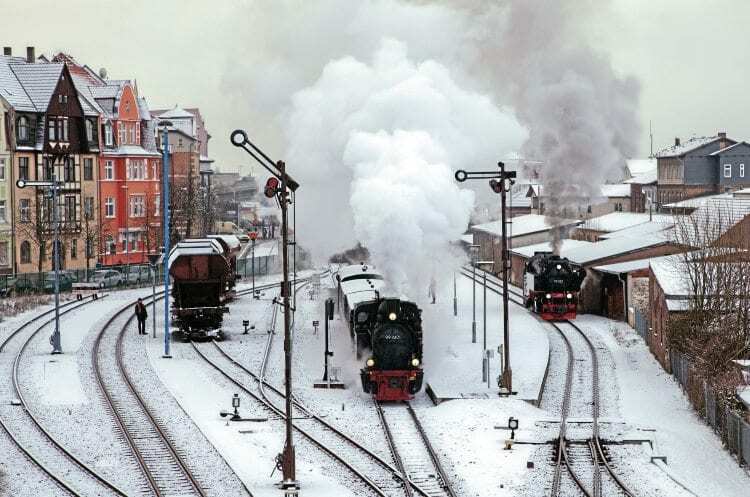 Such scenes are rare in Great Britain, but Chris Milner reflects on a trip to an historic and scenic part of Germany, where steam trains run all year round and there’s usually snow over the winter. THINK of a railway running through pine forests or scenic mountainous areas covered with snow and your first thoughts are likely to be Switzerland, Austria, perhaps Norway or Sweden. But add to the mix powerful metre-gauge steam locomotives working to a regular daily timetable, hammering up gradients as steep as 1-in-30 to the top of a mountain 3,675ft (1,125m) above sea level and there is probably one place you are likely to find all of these ingredients – the Harz region of Germany. There’s a Lowry-esque feel to this view of Nordhausen Nord station as 0-6-0T No. 99 6101 gets a special for Benneckenstein on the move, with No. 99 222 (on the left) waiting to move forward to collect the ‘rollwagons’. These are narrow gauge flats able to carry standard gauge wagons. No. 99 6101 was one of two locos supplied initially to the Heerestechnische Prüfungsanstalt (Army Technical Research Institute) before transferring to the Nordhausen-Wernigerode Railway. Around the Harz was once the habitat of bears, bison and wolves, but today lynx are more common. Mining was prevalent around seven towns in the upper Harz, the last closing in 2007, but today, with many spa towns, timbered buildings and the option of winter sports, walking and climbing, tourism is the area’s main income. 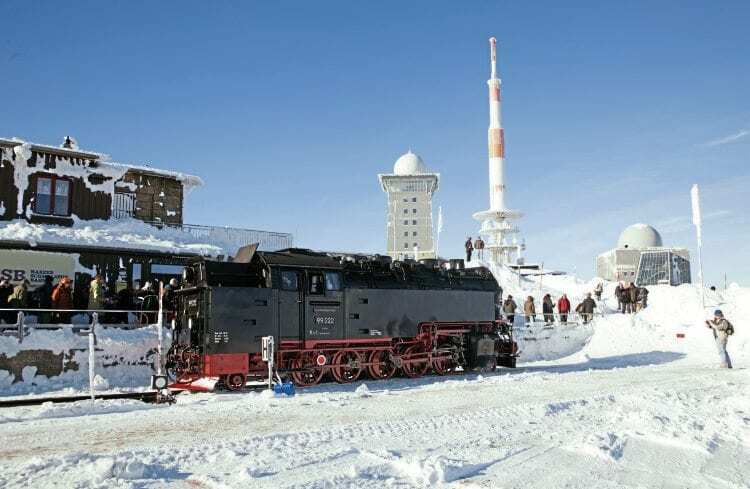 It’s an all-year round destination and, depending on the time of year your visit, then any two of the three possibilities of snow, steam and sun are pretty much certain with a trip to visit the Harzer Schmalspurbahnen (usually known as ‘the Harz’ or HSB). Mind you, the appearance of sun can be pot luck anywhere! Prototype HSB 2-10-2T No. 99 222 sits at Brocken station. The loco carries its original number as opposed to its HSB fleet number of 99 7222. With the station behind the loco, the taller building is a former transmission tower dating from 1937, while to the right the smaller building is Brocken House, a former Stasi (East German secret police) headquarters and now used as an information centre for the Harz National Park. The 123m red and white tower was erected in 1973 and used for TV and radio transmissions. The Harz is an area of Germany that is quite easy to get to, with budget flights from several UK airports to Hannover, Leipzig, Dresden and Berlin. From any of these airports there are options of rail or road (using a hire car), the train taking between 1hr 50m from Hannover to four hours from Dresden because of the connections needed with indirect journeys. Drive time by car is 1½ to 3 hours. St Pancras using Eurostar and DB’s ICE services the fastest journey is a few minutes shy of 10 hours with change of train at Brussels and Frankfurt, and is a very relaxing way to travel, watching the world pass by. The HSB has its headquarters in Wernigerode, a picturesque town of slightly more than 35,000 people in the Saxony-Anhalt region of Germany. Timbered buildings are everywhere and Wernigerode has a fairy-tale castle and quaint town hall. The HSB is one of the area’s largest employers with around 260 staff, including 12 apprentices. 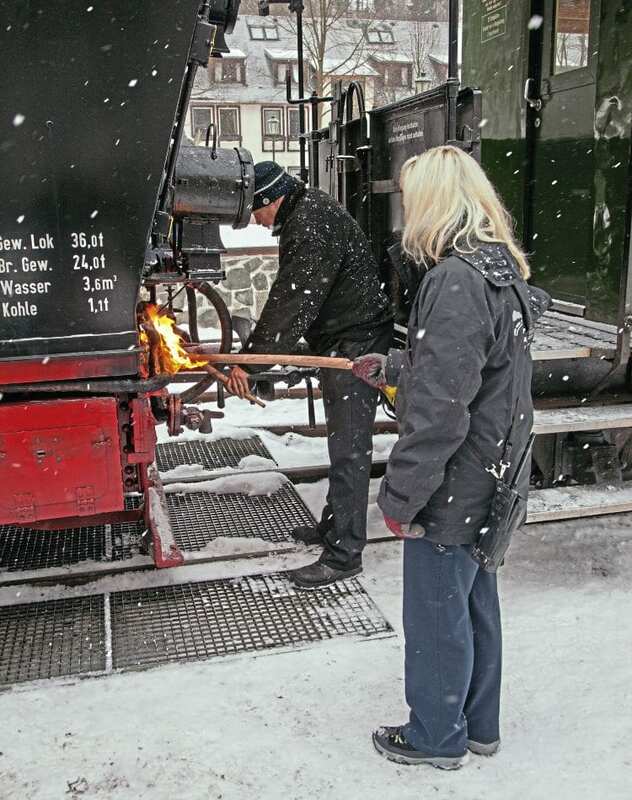 Frozen steam-heating pipes can be a common occurrence in winter, and at Alexisbad station a member of the train crew thaws the pipes with a lit taper. The railway, whose three routes cover 140km (87 miles), attracts 1.1 million passengers every year and is the area’s leading tourist attraction. It’s not surprising considering the HSB is Europe’s longest railway network with daily steam trains, running to the top of the Brocken mountain. Most HSB services are hauled, solid-looking 2-10-2 tank locomotives, the most powerful of their type in Germany. They were designed by Deutsche Reichsbahn and have a service weight of 65 tonnes but an axle load of 9.5 tons, so ideal for the terrain of the Harz. Built between 1954-56 by LKM (Lokomotivbau Karl Marx at Babelsberg, Berlin) the HSB has a fleet of 17 numbered 99 7231-99 7247, built specifically for the Harz and Brocken lines, but also a line from Eisfeld to Schönbrunn.